The new hard drive is ready to go in my Macbook Pro. Closed her up. I booted from my Leopard startup disk, erased the new drive, and ran an install from a backup on my Time Machine drive. It works like a champ. I am using it now. Little is more satisfying then geeking your own hardware (and yes, this was elementary, or pre-school in terms of difficulty). 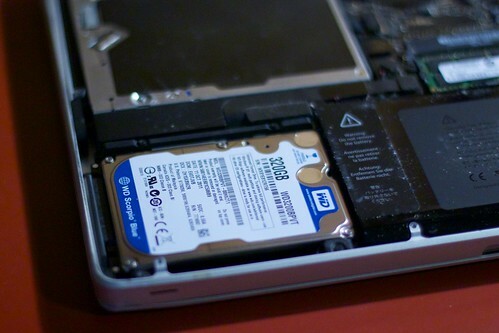 As the followup to The Day My MacBookPro Died, today I successfully performed a Hard Drive transplant. It was drop dead easy to do (there are tons of guides, I used the one from ExtremeTech. And to follow up on the philosophical bag of gold left me by Stephen Downes, why is she alive? BECAUSE I FREAKIN FIXED HER. Always feel good to break open something that’s supposed to stay sealed shut and “monkey” around with it. I hope the new drive is filled quickly with lots of new images.